Tight Joints PLUS's combination of ingredients were put together for maximum efficacy. It works first on the inflammation with the 6 ingredients to support comfort and fight inflammation. What Was The Inspiration For Tight Joints Plus For Dogs? Tight Joints Plus for Horses was so successful in treating horses with joint and soft tissue issues, that people started sprinkling it on their dogs food. We decided that we would repackage the product with the appropriate size scoop so users would know how much they were giving versus just guesstimating. What Sets Tight Joints Plus For Dogs Apart From Other Joint Supplements? Tight Joints Plus For Dog's combination of ingredients were put together for maximum efficacy. It works first on the inflammation with the 6 ingredients to support comfort and fight inflammation. Anytime there is inflammation, your dog will experience discomfort, so we added natural ingredients that support comfort and relief to your dog. When the inflammation is gone then the 6 joint rebuilding ingredients can go to work repairing. You will not find another product on the market that has this combination of ingredients, with the levels of active ingredients in a single dose. This is why it works!! What Are The Ingredients In Tight Joints Plus For Dogs? How Does Tight Joints Plus For Dogs Work? Note: The animal nutritionist that formulates Tight Joints Plus has studied for many years that in order for joint supplements to work the first step is to reduce the inflammation. When the inflammation is gone the joint repairing agents can begin to do their job. What Is The Recommended Feeding Dosage For Tight Joint’s Plus For Dogs? Tight Joints Plus is a Powder and has a scoop included in the container. Analysis is based on 1 scoop per 20 lbs. Give 1 scoop for each 20lbs of weight. The Tight Joints Plus for dogs contains 250 scoops. Can My Dog Enjoy The Benefits of Tight Joints Plus For As Little As .18 Cents Per Day? Yes! Despite the tremendous results, Tight Joints PLUS is very affordable. Fed at 1 scoop per 20 pounds. So a 40 pound dog can be fed Tight Joints Plus for as little as about .36 cents per day. We did a controlled case study on a 6 year old male dachshund suffering from severe back and hip pain. The pain had advanced to the point the dog could not handle being touched and had a hard time walking. This pain and suffering had been going on for 6 months. After many trips to the vet, crate rest, and pharmaceutical pain relievers and anti-inflammatory the dachshund was not getting better. The vet recommended sending the dog to Washington State University for an MRI and surgery. With nothing to lose except thousands of dollars in vet bills we decided to try Tight Joints Plus on him as the last resort before surgery. All medications were stopped and Tight Joints Plus was started. Within 1 week the dachshund was showing significant signs of improvement. Within 14 days he was running again, he could be touched without crying out in pain , and he was becoming a healthy dog again. After a month of Tight Joints Plus the Dachshund was back to full activity and no longer had any signs of discomfort. The dog has now been happy and comfortable for months thanks to Tight Joints Plus. Order Tight Joints Plus Today For Your Dogs and See The Difference! Doesn’t your dog deserve the best? 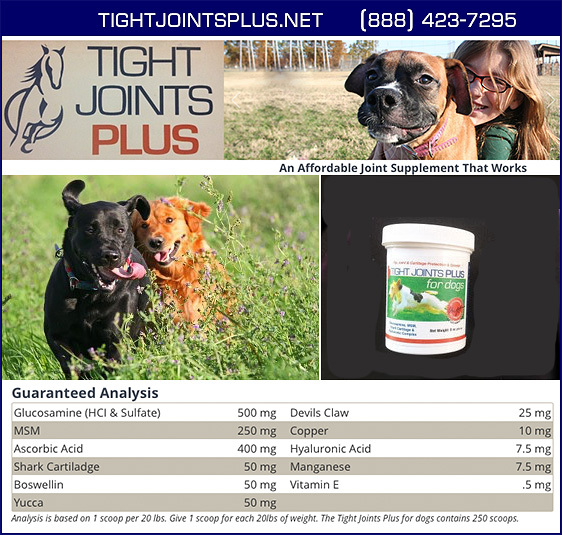 Tight Joints Plus has been on the market since February 2012, the success stories of what this product has done for so many dogs, as well as horses, are more than anyone could have imagined. We believe in this product 100%, not only for your horses and dogs, but for our own. Call us and order today— your dog will thank you.